Netherlands based Vitters shipyard recently delivered its highly anticipated 33m carbon fiber sailing yacht, Missy. The sleek superyacht was designed by Malcolm McKeon Yacht Design and built at Vitters’ Zwartsluis yard over a period of two years. Built with a mind toward sailing performance Missy features a narrow 7.5m beam, lifting keel and robust sail plan on her sloop rig. In addition to performance sailing Missy was built with comfortable family accommodations in mind. The interior, designed by Design Unlimited is contemporary oak with a relaxed, social environment including features such as a galley that is open to the saloon. The overall interior accommodations include four cabins for eight guests and a crew of up to four. “Missy has a spacious, comfortable interior in which a lot of attention was devoted to the efficient use of available space on board. The compact engine room is fitted with a great amount of equipment and state of the art technology, while no compromises has been made on comfort or the use of advanced technologies,” according to Vitters’ CEO, Louis Hamming in a press release after she was launched. 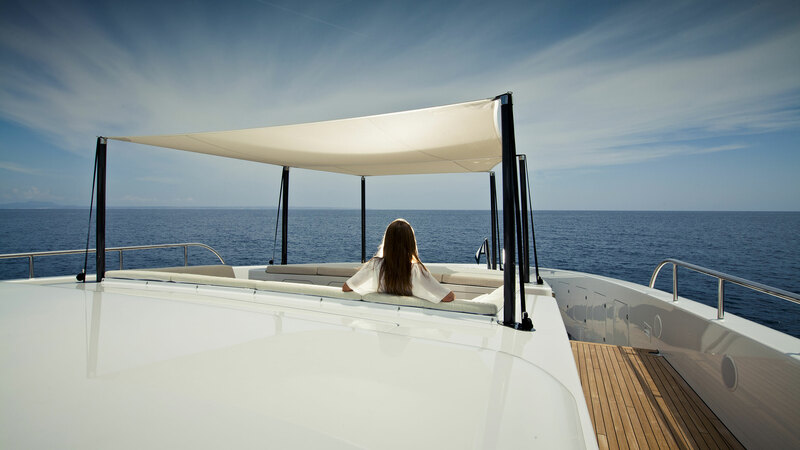 Additional design innovation that went into Missy’s build and contributes to the sleek profile are features such as a fully automated dodger and bimini that can retract to sit flush with the superstructure. The large glass superstructure that covers the main saloon adds a feeling of airy openness while simultaneously letting plenty of natural light into the heart of the interior. The superstructure also features heat reflective layers to aid in keeping the interior cool while reducing energy costs for climate control. Missy’s large lazarette and tender garage can accomodate a 4m tender along with additional water toys. Missy is ultimately destined to embark on a worldwide cruise after a shakedown period of coastal cruising. She will undoubtedly provide the owner and crew with a luxurious and comfortable ride as they cast off to explore the globe.